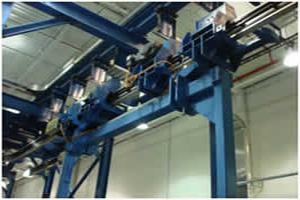 EMS - ASI Heavy Duty Electrified Monorail System - Automatic Systems, Inc. Assembly and Final Dress of Large Engines can be achieved on a quiet, clean and safe ASI HD-EMS conveyor system. ASI Heavy Duty Electrified Monorail System Carriers travel from station to station for component assembly and required torque of fasteners. 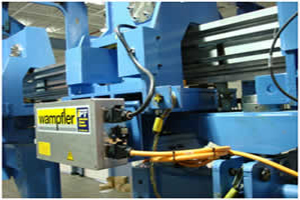 Power for the carrier trolley is supplied by Wampfler IPT power rail, eliminating all maintenance of typical conductor bars and brush systems. Non-contact communications with carrier controls to the main PLC is through the Wampfler iDAT communication modules. On board PLC smart controls and variable speed for each carrier is achieved with Lenze-Deto controls that seamlessly interface with the Wampfler IPT and the main ASI System PLC controls. Coded rail throughout the system provides exact positioning of every carrier. A family of engine sizes ranging from 1,500# to 7,500# product load, can be handled with flexible flip-up and down tooling. Safe movement for each carrier is achieved with optical sensors mounted on the front and rear of the carrier. 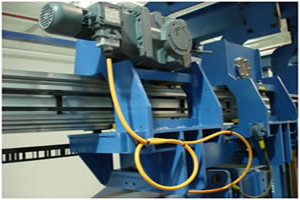 Carrier movement from station to station can be automatic or operator release as required by the process. 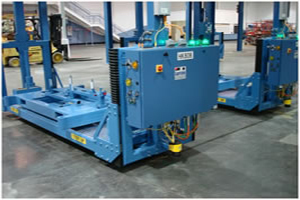 Each carrier includes servo motor controlled lift and rotate features for ergonomic access by the operators. Please contact ASI with your assembly and process requirements.